Hi all new people that join YSFHQ and legend. 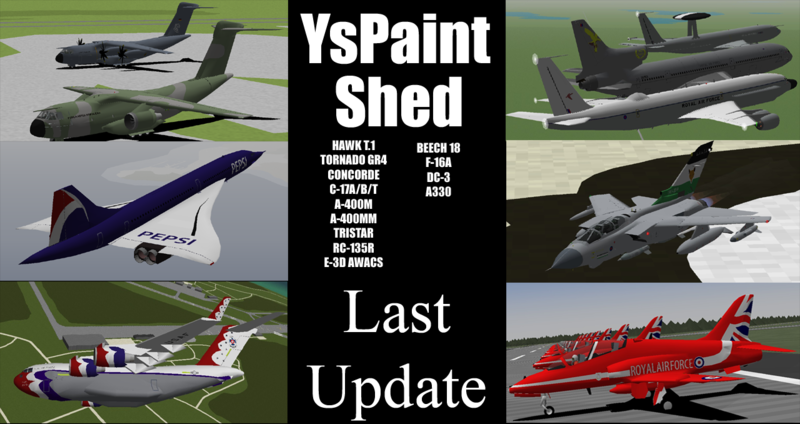 It is sad to say this will be my last update to my great success pack called Yspaintshed. It has been an honor to repaint and do the great aircraft like the tornado GR4, concorde, l-1011 tristar, Rc-135R river joint, world famous Red arrows, uk awacs e-3d, a-400m set, c-17 set and beech 18 + dc-3 legendary aircraft. I also like to tell you it going Raf 100 years and i probably going do them scheme but you got the e-3, tristar, a400m, tornado gr4, The Red arrows and c-17. pls let me know how you enjoy flying the models. just scroll down and click the link to download. I'll get this installed on the server tonight.